As the holiday season kicks into high gear, it’s easy to “fall off the wagon” with so many butter-rich, delicious baked goods surrounding you at office parties, family gatherings and such. One of the strategies I use to combat this potential problem is to volunteer to bring baked goods from my kitchen. That way I can control the quality of ingredients, especially their nutritional value, and ensure that there will be something delicious and nutritious available for me to snack on and for others to enjoy. Blueberry coconut muffins are a satisfying breakfast option during the holidays or a weekend brunch. Or you could easily turn it into a dessert option for the office or family party by making bite-sized blueberry coconut mini muffins. One of the things I like about this recipe is the use of coconut flour, coconut oil and coconut milk to achieve a flavor-upon-flavor layering that is subtle enough to let the fresh blueberries be the star of the show. I had not used coconut flour a great deal in the past, but I find that I’m using it more and more because sweet baked goods just taste better and lighter with coconut flour. 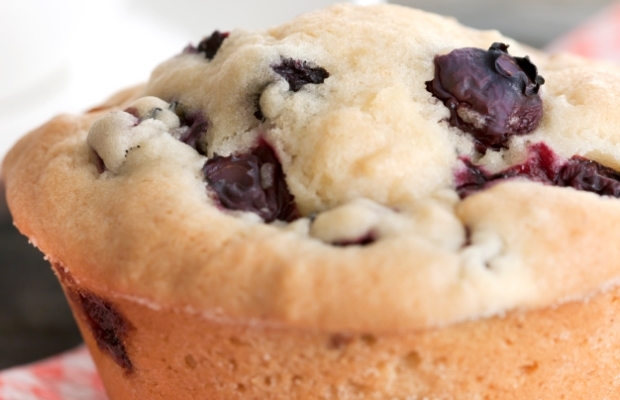 The coconut flour also has a mild sweetness that elevates and pairs well with the blueberries. Did you know that coconut flour is naturally gluten-free? Every ingredient in this recipe is gluten-free. Yea! Even though winter is nearly here, it’s still easy to find fresh blueberries in local markets. My local Mariano’s always has a great variety of berry harvests throughout the year and blueberries are available right now in Chicago. Preheat your oven to 350 F degrees. Lightly grease a standard 12-muffin tin and set aside. In a large mixing bowl, combine the flour, baking powder, baking soda, brown sugar, salt and coconut. In a separate medium bowl, whisk together the eggs, coconut oil, coconut milk and vanilla. Pour the wet ingredients into the dry ingredients and mix just until combined. Fold in the blueberries. Pour the batter into the prepared muffin pan with each tin about 1/2 to 2/3 full. Bake for 22 to 25 minutes, or until a toothpick inserted in the center comes out clean.